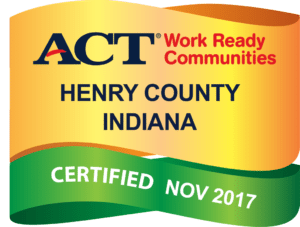 Henry County joins five other counties (Delaware, Randolph, Wayne, Fayette and Rush) in Indiana that are certified and have embraced this community led workforce development strategy. The NCRC is obtained by taking three Work Keys assessments: Applied Math, Graphic Literacy and Workplace Documents. According to ACT, the Applied Math assessment measures critical thinking, mathematical reasoning, and problem solving techniques for situations that actually occur in today’s workplace. The Graphic Literacy assessment measures the skill needed to locate, synthesize, and use information from workplace graphics. The Workplace Documents assessment measures the skills people use when they read and use written text such as memos, letters, directions, signs, notices, bulletins, policies, and regulations on the job. The NCRC is a reliable predictor of workplace success and provides a framework for helping people where they are at. The certification was earned by Henry County achieving specific data driven goals for the number of certificate holders within the emerging, current and transitioning workforce. Over 2,000 people in Henry County have earned the National Career Readiness Certificate. For more information, please visit https://www.workreadycommunities.org/ or by calling the Economic Development Corporation at 765-521-7402.